It has been one of those days that I am sure many of you have had. A long day, nothing planned for dinner, in no mood to cook, but craving something delicious. When I opened my fridge I realized that I had very little to work with, so I got creative with what I had and came up with a great beef stew. As much as I had not planned what I was going to throw together for dinner, I always try to prepare myself for days like these. It is always handy to have meal ideas that can be prepared using staple items that you always have in the cupboards and fridge. For example, I always freeze some stewing beef as well as beef and chicken stock, as it can be used for many soups and stews. I’m also always well stocked with fresh vegetables like carrots, onions and celery, as they are very versatile and used in many recipes. In French cuisine, they are the three base vegetables for most stocks, soups and stews. 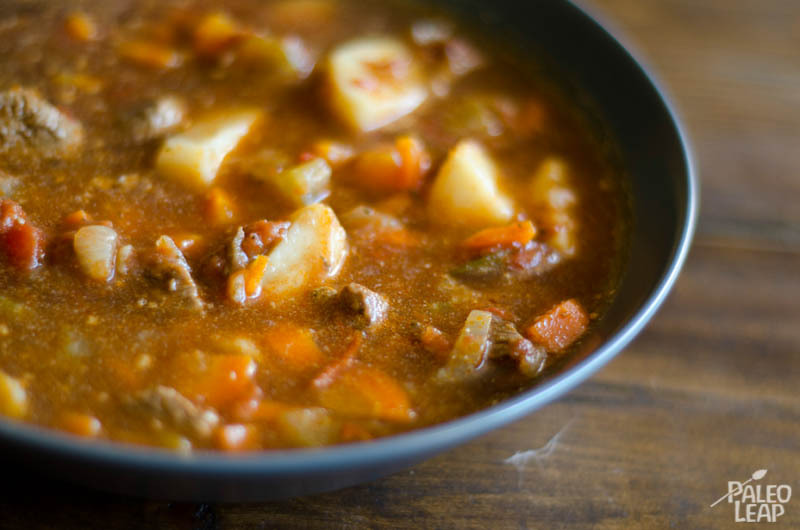 Why not throw together a hearty stew and let it simmer for a few hours while taking some much deserved time to relax? Try it out and like always, you are not restricted to these ingredients, as your staples may be different from mine, but can still produce a delicious dish. You’ll see that I’ve thrown 2 optional white potatoes in the recipe. Those add great bulk and taste to the final stew if you choose to add them. For those who are still scared of white potatoes or who see them as inferior to other root vegetables, please refer to my article on Paleo 2.0 or my Pesto Mashed Potatoes recipe for a quick explanation on why carbohydrates or white potatoes are not the enemy and why the first Paleo authors were wrong in recommending against potatoes. 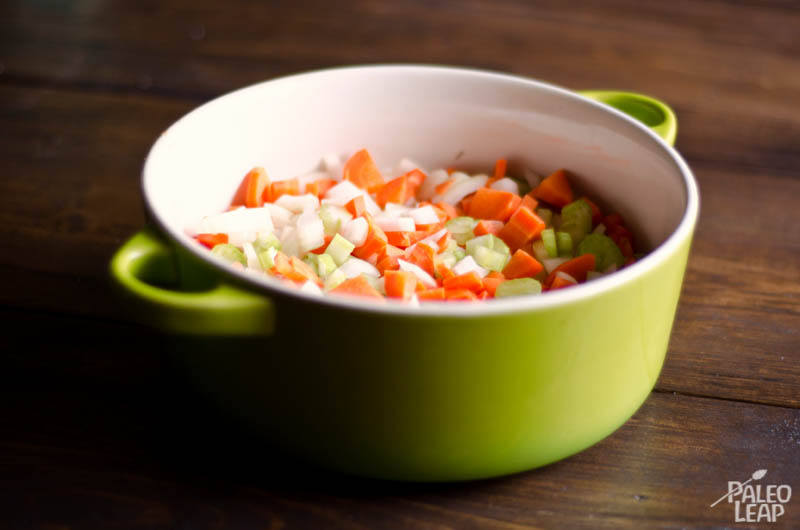 In a large saucepan over a medium-high heat, combine the onions, celery, carrots, potatoes, if using, as well as the cooking fat. Cook for 3 to 5 minutes, stirring constantly. Remove the lid and cook uncovered for about 45 minutes. If the mixture is too thick at the end of the cooking process, you can add a little bit of water or stock.